Thought I'd go a bit off-spec with this one! 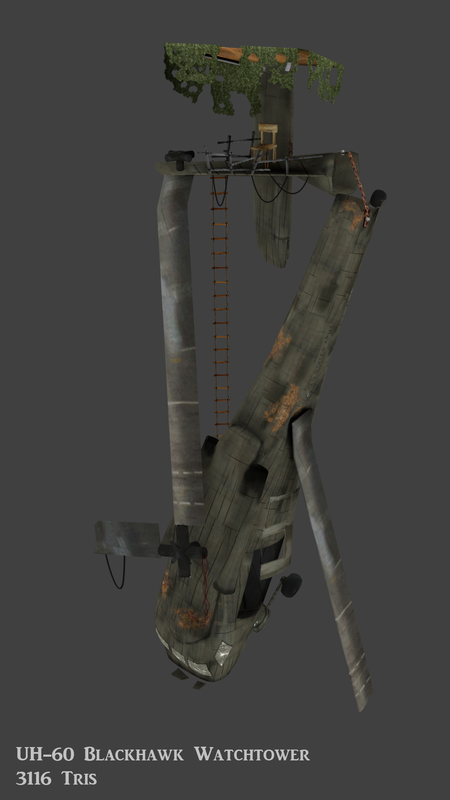 A UH-60 Blackhawk Watchtower Still might do some more work on it, add some more supports and work on the texture more. I think you really need to support it a bit more however as it is highly unbelievable in terms of stability.. Maybe wedge it among some huge rocks or have it supported by a massive treetrunk, like it was crashed there and was just slightly repositioned.. But to think of it, you may have been right to leave this thing to the mapbuilders..As they can use ready made assets for this. Thanks. Definitely agree it needs more support in some way, I was going to just stick some more poles in, but I'm sure I can think of something more creative. I want to get started on a new model before the deadline though, so might just leave it as is. Props, mate, we need more such ideas. Haha, thanks I hate the time it takes between getting the idea in your head out into reality. The first 5 hours are fun, you're fuelled on the idea - the next 10 hours, you just start to hate it!